At the beginning of each year we always sit down and plan out a few projects that we would like to accomplish around our home. Some years these are small projects, and some years these are big projects. We moved into our current home around six years ago. We were newly married and even though we already owned a home, it was a home we knew we would quickly outgrow if/when children came into play. We took advantage of the down market and found a neighborhood we absolutely loved. We spent months working with the builder meticulously designing every last detail even down to switch plate covers. The advantage of building a home in the down market is that pricing on several items and labor was a lot less expensive than it normally was. The disadvantage, in our case, was that it often came with a price - usually in the form of irreversible mistakes. Our kitchen took the largest hit. While the overall vision was what we were thinking from afar, up close it was missing a lot of the features we had dreamed of. Long story short, the builder made a lot of design miss-steps (i.e. wrong backsplash, wrong island cabinetry, wrong color granite - you get the idea), and wasn’t willing to change them even when pressed. After a lot of back and forth, we decided to roll with the punches and just plan for a kitchen renovation shortly after we moved in. As each year has passed, we’ve always brought up building our dream kitchen, but ultimately couldn’t decide on what we truly wanted, and other projects seemed to take precedent (hello, three babies!). Well this is the year! We have finally decided to tackle this fun project to create our dream kitchen, and are completely stoked about it. Even more important, Mr. Cute and I have agreed on design and feel that we both like! That, my blog reading friends, is almost harder than the actual renovation itself. Our old house had a white kitchen, and it was extremely hard to keep clean all the time. When we designed our current kitchen we ended up going very dark, and while we love the rich tones, we find ourselves wanting to lighten it up just a twinge. 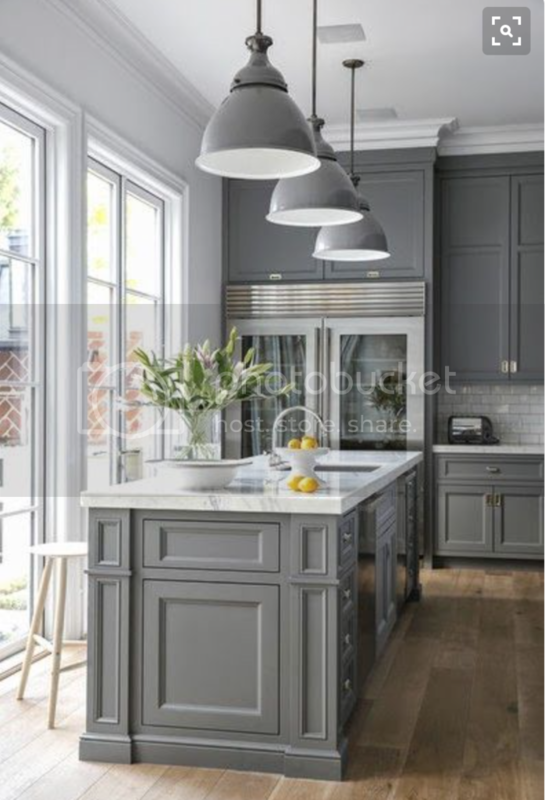 For our dream kitchen, we found this photo for inspiration. We love the grey cabinets and the white marble counters and backsplash! We plan on keeping most of our stainless steel appliances, and think it will coordinate perfectly. We’ve also thought about keeping our current island cabinetry, which is expresso with a bead board style front, as a contrast, but aren’t 100% on that yet. Thoughts? 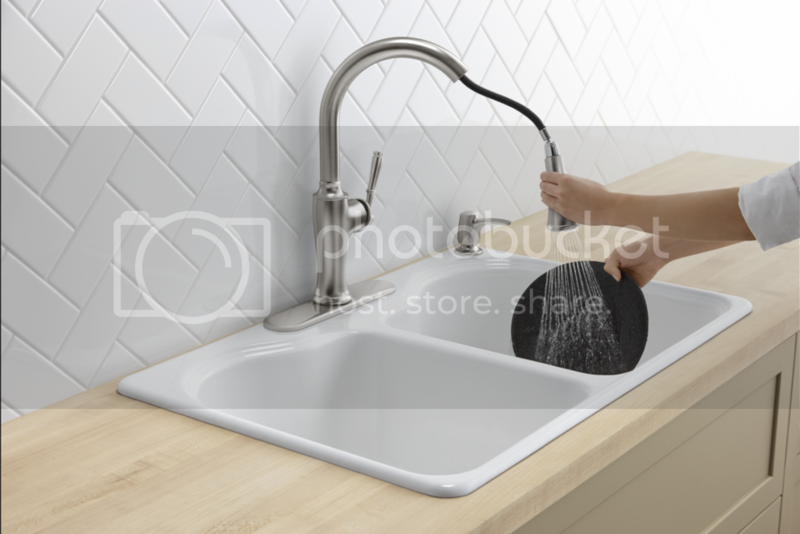 One “must-have” item on our list is a new sink design. We really want a farmhouse style sink, or at least one large basin. When we originally designed our kitchen I didn’t think to measure the sink against our pots and pans to see if they would fit well in it. The current set up makes for some awkward, and extremely wet cleaning sometimes. I also can’t wait to see our current faucet go! 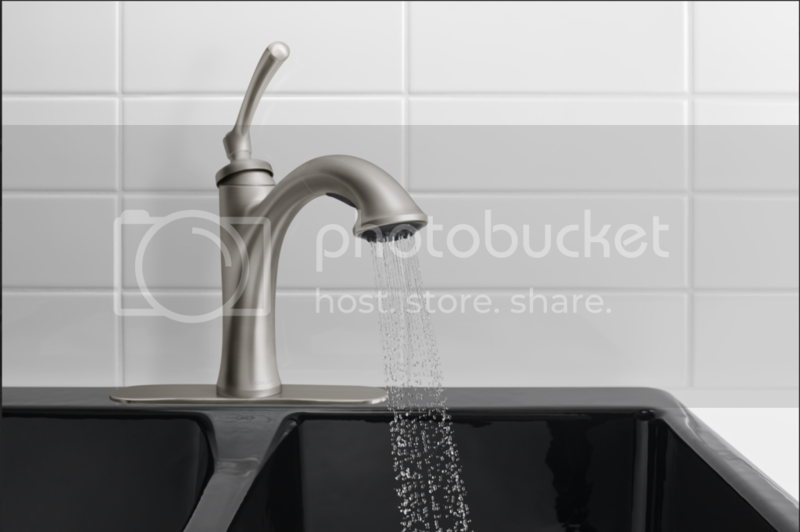 It was one of the things we “upgraded” with the builder, but we ended up with the basic faucet. It’s never quite worked properly and often leaks. I’ve done a little browsing on one of our many trips to Lowe’s and found myself gravitating towards two different Kohler faucets. I love the Kohler brand designs and the quality is always top notch. 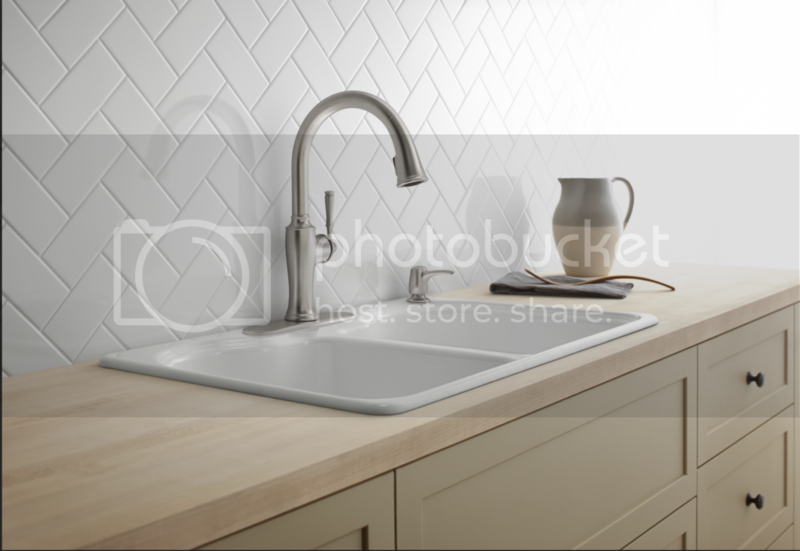 The Kohler Cardale Kitchen Faucet is a sleek little design, that comes with a lot of features we are looking for. It specially designed with a Sweep Spray feature that creates a large force of water to sweep away even the toughest of food that gets stuck-on dishes and pans. I also love that it comes with a temperature memory feature that allows the faucet to be turned on and off at any temperature setting - no more guessing when hot is too hot! With additional features, such as a 2-function spray head, the ability to have a left or right handle install, and 360 spout control, the Cardale Kitchen Faucet is definitely a top contender. The second Kohler design that I like is the Elliston Kitchen Faucet. It is available in two different finishes that would both compliment our dream kitchen design, and comes with optimal height and reach so that we will have plenty of clearance beneath the spout for our larger pots and pans - definitely a major on my list! The Elliston Kitchen Faucet also features the Master Clean system on it’s spray face so that it resists mineral build-up and makes for easier cleaning. I love knowing that the faucet will be a breeze to maintain. 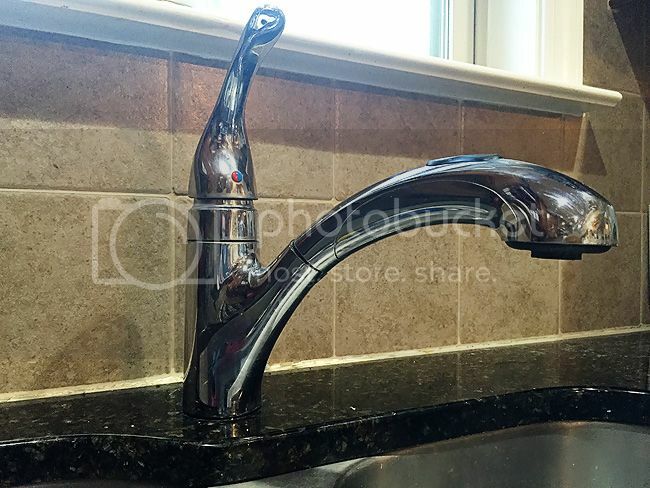 It is also designed with Kohler’s unique Scratch Shield so that the finish of the faucet itself will resist corrosion and tarnishing - bonus because the last thing I want to do is to plan to replace a faucet again! We are so excited to get this project underway in the upcoming months. The kitchen is where we spend most of our time with family and entertaining, and we know that creating our dream kitchen will make this feel even more like our forever home. What would you include in your dream kitchen? Hello there. 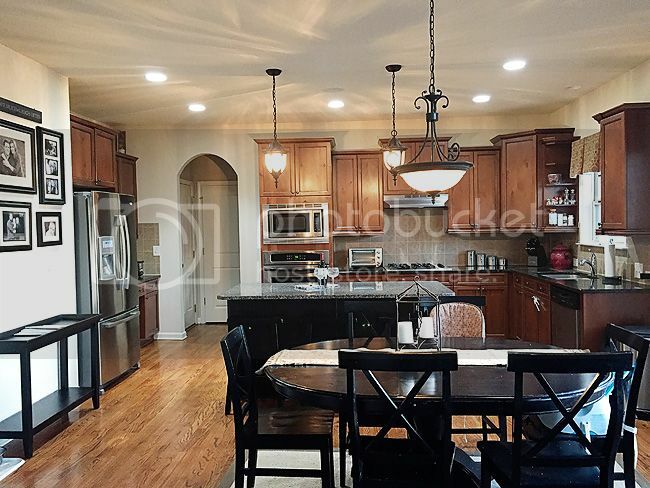 Thank you for sharing about your plans on having your dream kitchen. We may sometimes have some changes on our plans because we know that it's for the best. Whatever doubt you have, don't forget to always seek help and advice from professionals and experienced home contractors. I hope you have or will achieve your dream kitchen. Good luck! Kitchen Renovation In Vaughan at gta-contractors.com.